What a long cold winter it's been! How cute is this little flower? Change the ribbon color and your embellishments and this will be a match made in heaven for any outfit for the first spring breeze. Cut your first color of 3/8 ribbon into four 10 inch strips. Seal ends by running your lighters flame across the ends. 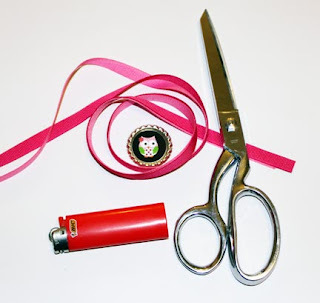 This process melts the ribbon slightly and will prevent any fraying. 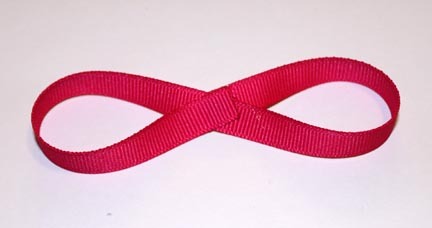 Shape ribbon strip into a figure 8. I can already hear the groans echoing "I can't do that!" Here's the pro tip master cheat. Fold your ribbon in half, bring the top half of the ribbon strip towards you and twist at a slight angle then tack with hot glue. 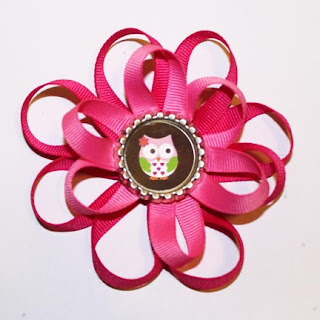 Bring the bottom half of the ribbon strip back and twist at a slight angle to match the top half then tack with hot glue. Repeat with all remaining strips. Arrange in a well spaced order that seems pleasing to you then glue all of the centers of the 8's in your stack together. You could stop here and add your center but we really liked the look of a contrasting color. The additional layer also gives your flower some more depth... and let’s face it... more ribbon is... well... MORE! For the second layer we used 3 strips cut to 8 inches and repeated the steps above. Glue both of your Crazy 8 daisies together, and then add your choice of center embellishment. You could use a bottle cap, acrylic rhinestones, beads, blingy buttons, marabou or anything else you have laying around. Now, all we have to do is wait for spring. It's coming... right? It has to be! I just has to!